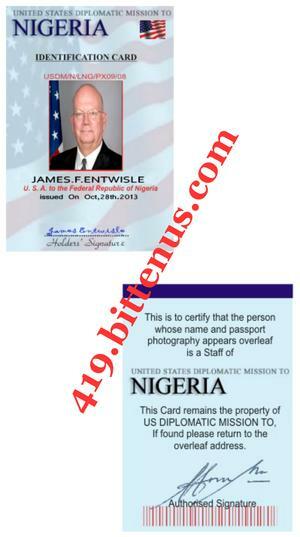 I AM AMBASSADOR JAMES F ENTWISTLE THE NEW APPOINTED USA AMBASSADOR TO NIGERIA, I SHALL BE COMING TO USA FOR A MEETING AND I WANT TO LET YOU KNOW THAT I WILL BE COMING WITH YOUR CONSIGNMENT PACKAGE. SO ALL YOU ARE ADVISE TO DO IS TO FURNISH ME WITH YOUR PASSPORT PHOTOGRAPH AND YOUR DELIVERY ADDRESS ALSO YOUR NEAREST AIRPORT WERE I WILL ARRIVED. FINALLY NOTE THAT IT WILL ONLY COST YOU ONE HUNDRED DOLLAR ONLY ($100) AS I WILL USED IT TO REGISTER YOUR CONSIGNMENT AS AMBASSADOR PACKAGE SO THAT ON MY ARRIVAL TO ANY AIRPORT YOUR CONSIGNMENT WILL NOT BE CONFISCATED. THIS IS THE SECOND TIME I AM SENDING YOU THIS MAIL TO YOU , WITHOUT MINCING WORDS, I AM CONVINCED 100% THAT YOU HAVE HAD BITTER EXPERIENCE WITH VARIOUS SCAMMERS & #39;CLAIMING TO BE HIGH GOVERNMENT OFFICIALS BANKS AND THEREBY DEFRAUDING YOU OF YOUR HARD-EARNED MONEY& #39; THE ACTIVITIES OF THESE SCAMMERS HAS CHANGED YOUR PERSPECTIVE ABOUT CONDUCTING BUSINESS ON THE INTERNET AND YOU NOW BELIEVED THERE IS NO GENUINE BUSINESS THAT CAN BE CONDUCTED ON THE INTERNET. WELL I AM AMERICAN AND THE INTERNET WAS CREATED BY AMERICANS FOR THE PURPOSE OF CREATING; AWARENESS FOR YOUR PRODUCTS/ SERVICES AND CONDUCTING GENUINE BUSINESS WITH EASE. I AM FULLY COMMITTED TO DELIVER THE DIPLOMATIC CONSIGNMENT TO YOU.I Am A FULL CITIZEN OF THE UNITED STATES BUT I WAS ON A MISSION HERE IN NIGERIA AS A US AMBASSADOR TO NIGERIA. HENCE, I AM MAKING EVERY EFFORTS TO ENSURE THAT KNOW INDIVIDUAL IS CHEATED BY NIGERIA/BENIN REPUBLIC. THEREFORE, I NEED YOUR UTMOST SUPPORT AND UNDERSTANDING TO ACTUALIZE THIS DREAM. I ALSO WANT YOU TO UNDERSTAND THAT I DO TRUST YOU AND I EXPECT YOU TO SHOW ME THE SAME TRUST AND RESPECT IN RETURN SINCE TRUST IS A 2-WAY STREET. ON THE OTHER HAND, TRUST IS A RELATIONSHIP OF RELIANCE. TRUST ALSO MEANS BEING ABLE TO PREDICT WHAT OTHER PEOPLE WILL DO AND WHAT SITUATIONS WILL OCCUR. YOU HAVE REALLY PAID SO MUCH IN THIS DELIVERY THAT MAKES ME WONDER. YOU ARE A VERY LUCKY PERSON BECAUSE I SHALL BE BRINGING IT MYSELF AND THERE IS NOTHING ANYONE CAN DO ABOUT IT. CHECK HERE: http://nigeria.usembassy.gov/biography.html YOUR PACKAGE($15.5M) MUST BE REGISTERED AS AN AMBASSADORIAL PACKAGE FOR ME TO DEFEAT ALL ODDS AND THE COST OF THE REGISTERING IS $200.THE FEE MUST BE PAID IN THE NEXT 50 HOURS VIA WESTERN UNION SO THAT ALL NECESSARY ARRANGEMENT CAN BE MADE BEFORE TIME WILL BE AGAINST US. 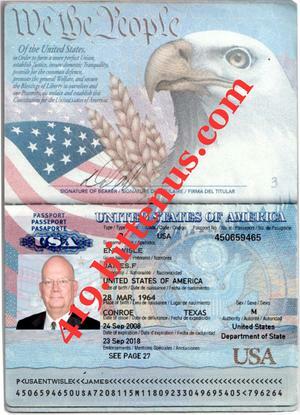 CONTACT MY SECRETARY IMMEDIATELY FOR THE REGISTERING FEE WHICH IS $200 ONLY. AS SOON AS YOU SEND THE FEE MAKE SURE YOU SEND ME THE PAYMENT INFORMATION. MY FLIGHT IS FRIDAY AND I EXPECT YOU TO COMPLY BEFORE THEN SO THAT THE DELIVERY CAN BE COMPLETED. IF YOU DO NOT COMPLY, THEN IT WILL NOT BE MY FAULT IF YOU DO NOT RECEIVE YOUR PACKAGE. Therefore, try to understand me and be free with me as I can assure you that you have absolutely nothing to fear or worry about, as this transaction is legit and you are also dealing with the right office,You should also know that as far as I am concerned, nobody is feeding on your money. And I am not interested in it. If not for the purpose of your parcel we shouldn' t have in the first place asked you a cent. So I am making it succinctly clear that I a not after your money. My duty is to make sure that you receive your Consignment immediately is registered once you send the needed fee and that is all. The Choice is yours. you have 48 hours to comply with this mail. to I don' t want you to see it as if I am forcing you against your wish. I have told you nothing but the truth about this parcel ; I am not a party to any other thing other than this. Subject: YOUR FUNDS PACKAGE DELIVERY. . . . This is to inform you that after an official meeting held with the (IMF), the President of Nigeria and Minister of Finance and also the EFCC concerning unpaid and unclaimed funds to foreign beneficiaries, just like you. I was very much annoyed when I found out that you have paid much money yet you never receive your funds and that prompted me to help you.